Date of publication: February 13 2014 . In the house there are many other things came chaos and disorder. Daily cleaning becomes pointless. It sounds a little sinister? All is not so! Just in the house there are a couple of mischievous kids. If your square footage do not allow to give each of them a space separate from each other, and they live in one room, which also wants to organize their stay profitable, while our current modifications can be very useful. bolts, nails, saws and hammer. 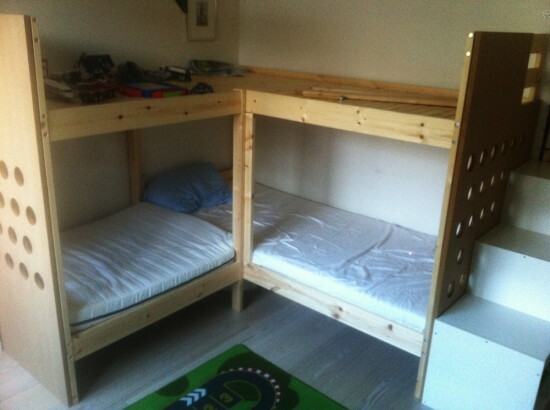 Bunk beds like children, but they can be a source of danger to the sleeping child. 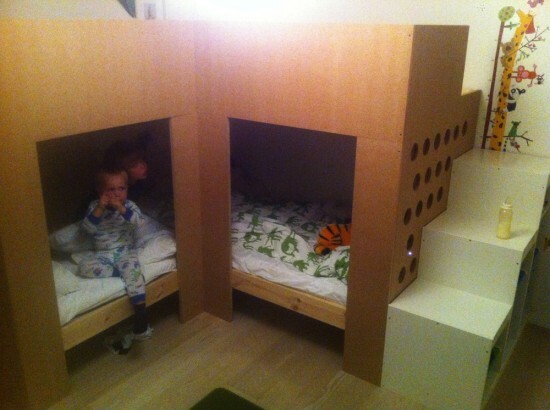 Connect 2 2-frame bunk beds MIDAL: on the first floor baby is resting, and second It uses passive games like designer assembly. Before dock beds, one of them must be cut so that during the formation of the unitary structure are, each bed eventually equal 2 meters. Stairs, Which is equipped with a bed, as well as the side walls are removed from the second floor. Two Mead joined together with bolts. To improve the strength of the assembly is not superfluous to install additional bracing in the form of staples, or any other devices. Next, cut out of sheets of MDF four panels We needed size. Two of them (157h97 cm) are mounted on the bed width. The rest are used for the manufacture of restrictive boards in length on the second floor, as well as connecting them stitched corner and bed sides. The result is a unique entry in the "sleepy" at the bottom and fenced game area above. To design does not seem solid and does not create an impression of similarity with huge boxes, you can hold back lighting on one side can be cut out rows of round holes. Through them you will be able glances of children. The staircase was removed, all stitched panels. How do the children get to the second tier? 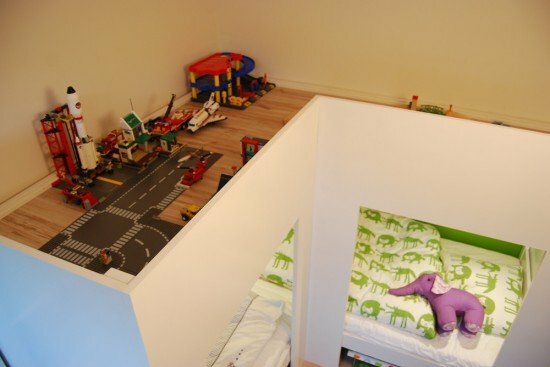 The combination of storage IKEA catalog in the form of a ladder that was set over the side of the bed is suitable for moving on the playing field. On this side of the panel can be made small the door. TROFAST Three-stage lift to the desired height. 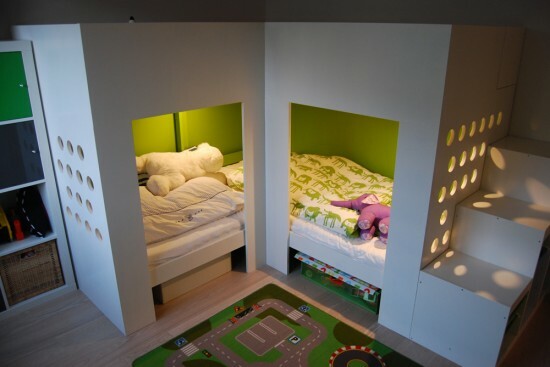 To make this kind of children's joy complete, we paint the all the details of a bed and zalaminiruem them. 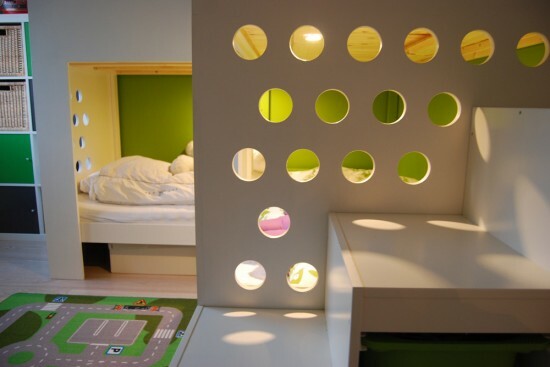 Color It varies on your preferences and interior children's room. In our opinion, the most preferred color is white. He not only did not increase the weight of the look, but refreshing the whole room. Of course, kids will soon outdo size MIDAL. And as they grow and learn about the world in our power to make them feel comfortable doing it. Why not start with their own little corner?